The Mr. 50’s glasses are versatile glasses for any number of characters. 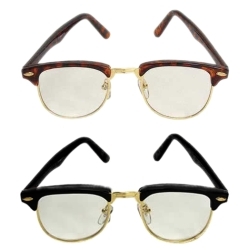 These glasses work perfectly for men of the 1940’s and 1950’s, for school teachers, for lawyers, and for grandfathers. They are great for stage and are very popular with our directors who are doing plays set in the 1940’s, 1950’s, and 1960’s. The Mr. 50’s glasses are available in black or brown frames.